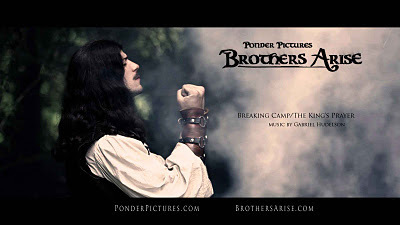 This piece is from the soundtrack to Ponder Pictures' "Brothers Arise." This screenshot actually comes from the scene for which this piece was written. Many thanks to the director for this excellent image, and for being an all-around really nice guy. He really has a heart for The LORD, and I look forward to watching God use him in the future! The finished score in the film is slightly different than this piece (and I like it better! ), but this is almost the finished product. Enjoy! If you want to hear a version closer to the final one, check out the YouTube upload. Slight differences, but they are indeed there. Haha! Thanks, Corey. I'm honored by the comparison. May God be glorified! I LIKE IT!!!! Awesome job! Ech, the guy's hair is too long and pretty; I keep wanting to see a woman there. Heehee... yeah, I didn't have say in the hair length issue. For some reason, it seems to fit that era, but I still would prefer short. Ponder Pictures...I was wondering what these guys were up to. I met Spencer Weaver at a homeschool convention last year, and he seemed like a guy with a lot of knowledge and a good vision. I am very much looking forward to hearing about updates on this project. BTW, Gabriel, I think you'd appreciate my friend Peter Bringe's blog: www.forchristskingdom.blogspot.com. Thanks for the link! I believe I'm actually scoring a film that Peter starred in... Sons of Georgia ring a bell? Yes it certainly does. A loud one. I saw the trailer today on the Sons of Georgia website, which had your music on it, correct? Correct. The latest one did.